Just like in other popular RPG’s like Dungeons & Dragons, the Fyxt RPG system uses items and equipment to enhance player characters. The Fyxt RPG has a highly streamlined and powerful items system with a nearly infinite amount of item possibilities. Dive into Fyxt Items and see what you can find! It’s a lot easier to find the perfect item for your character in the the Fyxt RPG. Or, if you have an item in mind that will be great for your character, just build it with the Fyxt RPG Custom Item Generator! Subscribe to a premium Fyxt RPB membership to use and create Advanced Items! Thanks for playing. Use the filters below to narrow the choices of items. Login or create a free Fyxt RPG account to search the Specialty Database. 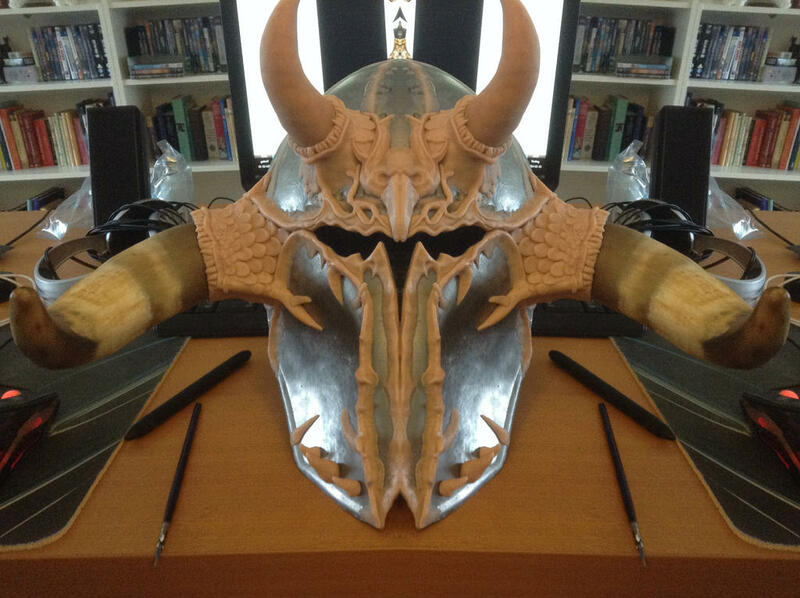 A brilliant golden helm with black horns curving down along the jaw line. Beneath this closed chapel de fer, your eyes become burning points and you exude palpable menace. This effect grants Combat Maneuvers +5. This effect grants Social +10. Exclude 5 targets from Area of Effect or Space targeted Powers. This satchel has all of the basics that any thief might need in their line of work. This satchel has everything from tools to open locks, set traps, and forge documents, to scraps of clothes to quite armor, die and makeup for disguises. This effect grants Subterfuge +1. A universal translator, or UT, is a device used to translate alien languages into a language which the user can understand. Models vary. Some are able to only translate one language at a time. Others can translate multiple languages at once. This effect grants Language +8. This effect grants Language +7. This effect grants Language +9. This high quality leather apron is very handy to have when crafting. It allows the crafter to keep important tools nearby should they need them at a critical point in the crafting process. Being prepared allows the crafter to take advantage of critical Skill Rolls to further increase their check. When rolling a 20 on a d20 Skill Roll add an additional +15 to the final number. This normal looking cloak easily blends in with other common cloaks. However, upon use of the command word the cloak can change not only its appearance but the entire appearance of the one wearing it. This effect grants Social +2. This effect grants Subterfuge +5. This self fitting space suit is a must have for anyone that finds themselves in space frequently. This effect allows the target to ignore Major Environmental Effects. This effect grants the ability to move through gaseous areas normally. Add 5 to all attacks. The Eye of Radiance is about the size of a human male’s fist made of the purest blue sapphire. Within its finely cut facets there is another material that is in the shape of a pupil. The Eye of Radiance seems to always radiate a little ambient light and powerful magic can be felt coming from it. Thought to be the gem that sat atop a scepter of a god of creation, this huge gem emanates extremely powerful magic. When used the Eye of Radiance will bestow some of the powers it once held to the wielder. When being used the material in the center seems to shift as it focuses on its target. At the same time, the wielder can feel the eyes of the gods themselves watching their actions. This effect grants Athletics +5. This effect grants Attack +10. This effect grants Defenses +10. This effect grants Nature +5. This effect grants Perception +5. This effect grants Religion +5. This effect grants Scholar +5. This effect grants Social +5. Increase the Hit Point damage of a Power by 50% 1 time during Battle Time. Add 5 dice to all powers that damage Hit Points. Add 5 dice to all powers that heal Hit Points. Increase the Hit Point healing of a Power by 50% 1 time during Battle Time. Reroll 5 dice rolls of 5 or lower between every Full Rest. Calling forth all of the healing skill you know, you quickly heal many around you. Focusing raw energy on a massive area you unleash the energy on the masses hopefully eradicating the weak within the area. You develop a powerful spell to quickly move an army! Calling forth the magic of your gods you bring back someone who was slain a few months ago. With the blessing of the Gods themselves you call forth their powers of healing to heal your target's Hit Points by a lot.